Act #72: Walk a mile in their shoes. Do you walk or bike to your office everyday? Do you pack your lunch, but eat half your sandwich for breakfast, and save the rest for lunch? Have you considered giving up fresh fruit and bottled water? Your gym membership? How about turning off the heat, not wearing your make-up, not using your smart phone or computer? Giving yourself a daily limit on things like clean water, toilet paper, the length of time you stay in the shower, keep your lights on at night? Currently, 1.4 billion people live like this every day. That's 1.4 billion people worldwide who are forced to live on the U.S. equivalent of $1.50 per day, an amount defined by the World Bank as the accepted global figure of extreme poverty. This amount covers everything from food, health care, housing, transportation and education. 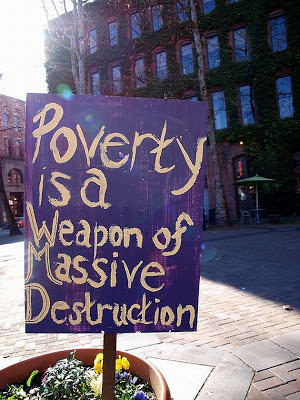 1.4 billion is 4 times the entire population of the U.S.
Live Below the Poverty Line is a campaign that challenges the way we - people in the U.S. - think about poverty. On April 30th, the campaign will launch its Corporate Challenge Day, a one-day event where companies and organizations across the U.S. show support in raising awareness and funding to end extreme poverty by living on $1.50 that day. For one work day, employees of participating companies and organizations will live on $1.50, while fundraising and supporting one of 11 charities with missions to eliminate poverty. Join me in signing your office up for this opportunity to demonstrate corporate social responsibility and to see what it's like for 1.4 billion people every day. 1. Talk to your work family and sign your office up at http://www.globalpovertyproject.com/blog/view/715. 2. Have your Corporate Team Coordinator sign-up, set a fundraising goal for the team, and create a team. By participating in Live Below the Line: Corporate Challenge Day, your company/organization will be featured on various social media platforms. Top fundraising teams will be advertised on GlobalCitizen.org and included in press-releases. 4. Once the Corporate team has been created, you can send your unique team link to your co-workers through social media, and e-mail.